Last night I had this awesome dream about riding in a laundry basket down carpeted stairs. I was flying down and just exhilarated by the speed! It sure beat folding laundry, which was the last thing I did before I went to bed (that'll teach me). I must miss racing if I've resorted to doing so in a laundry basket in my dreams. 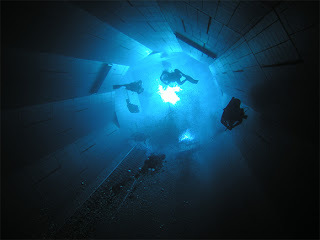 It's amazing I didn't have swimming nightmares. I went to bed knowing that first thing this morning I had time trials at the pool - a 400 followed by a 200. UGH. I rarely complain about anything training related, but swimming time trials are just not my favorite. They are so definitive and painful. Fortunately, I was treated to some good news. I shaved 8 seconds off my 400 PR and 6 seconds off my 200 PR which were set in October, just before Worlds. I did the 400 first, feeling strong and in control throughout, finishing with a good kick in the final 25 to come in at 6:07. Next came the 200, for which I've long wanted to break 3:00, and today was that day with a 2:56. Coach Jim was in the adjacent lane, ready with the high-fives. 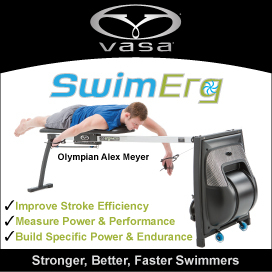 One big change to my swim training has been the addition of the Vasa Ergometer. I'm using it primarily as a supplement right now, just a few days a week. Being able to do dryland swim training and to really focus on technique and feel resistance in a way that is not possible in the water, has been very beneficial to me. I feel the direct translation to the pool. And to swim in 200m blocks (all I can muster right now without a break) on the Erg without the disruption of a wall is key too - no rest! I'm keeping a log on my swim training and look forward to more breakthroughs! See...you most certainly CAN get faster over 40!